I hope your children have enjoyed their first weeks of dance. Our teachers have had a lot of fun meeting new faces and welcoming back returning dancers. There is always a lot going on at the studio and these emails will help to keep you up to date. I have a few updates for the end of September. THANK YOU– A special thanks to everyone that walked in the UMASS Cancer Walk today! CLASSES THIS WEEK– If you had classes at the end of last week, you know there was a water leak in the ceiling above Studio B. We are currently working with the landlord to have studio B up and running 100% shortly, but we ask for your patience as we move a few classes around to different rooms this week. PARKING LOT– please do not park in the pickup/dropoff area. Dropoffs happen 10 minutes before classes begin. Pickups happen 10 minutes after. After 6pm, you can park on the hill of the exit side of the building. REGISTRATION STILL OPEN– Yes, we are still registering for dance. Have a friend that is interested in dance? Yes, bring them along and have them try a class. Speak with Miss Helen in the office for details. And yes, we can work with dancers that are finishing fall sports. Get registered soon to save your spot in class. OCTOBER TUITION– Tuition is always due on the first class or by the 7th of the month at the latest. IF you have automatic payments, Tuition will be charged to your credit card on the 1st of the month. You can also pay by check or cash in the office. After office hours, checks can be left in the tuition mailbox located in the lower waiting area. RECITAL COSTUMES– Recital Costumes are ordered in October. The class costume is required in order to participate in the annual recital. Even though we order cosutmes in the fall, costumes can take 2-4 months to be delivered. Your dancer will be sized by Miss Megan during class. Costumes are not custom fit. Costumes come in sizes much like clothing: Small, Medium, Large, etc. The costume will be ordered with a little room to grow. Costumes are $57 per creative movement class and $68 per all other classes. These will be added to your account shortly. Costumes payment due by October 13th. Automatic billing is for tuition only. You credit card will not be charge for costumes. You can pay in the parent portal by credit card or in the office with cash, check or credit. Any questions, please ask. CHARTER EMAIL- Charter has been blocking our email address lately. If you have sent us an email and it bounced back, you will need to add us to your safe sender list. Log into your charter.net email using a web browser and add our email address into our safe sender list. You can read an article on the charter page here. 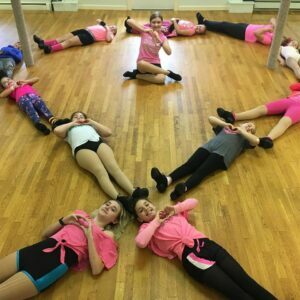 IT’S PINK WEEK– Have your dancer wear pink to dance OCTOBER 15-20 for breast cancer awareness. TODDLER CLASS– We have a GREAT toddler dance and play class on Tuesday mornings for dancers ages 18months – 2years. It meets at 11am and is ONLY $49 until the end of December. Not $49 a month, just $49 total. Spread the word. We have been having a great time! STUDIO CLOSED– The studio is closed 10/6-8 for Columbus Day and 10/31 for Halloween. Thank you for choosing GDA this year. We are so glad you are dancing with us. If you have any questions, please let us know.